landstuhltaylor doesn't have a personal statement currently. Looking for a 35mm hollow front bar. Either I'll find one used or sack up and buy the new adjustable one. Selling because I bought Penskes and have no use for these. 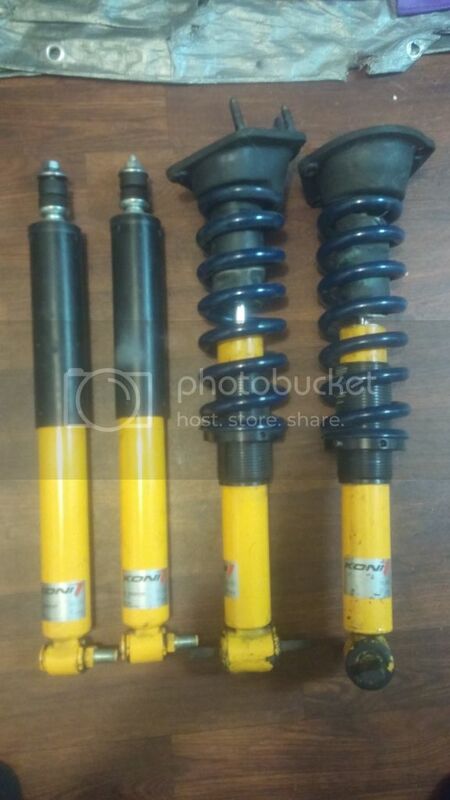 4th gen fronts with Allstar coilover sleeves and 3rd gen rears (both single adjustable, rear lower bolt needs to be removed to be adjusted) and the fronts include new Moog mounts with ~1000 miles on them, ~6000 miles on the shocks. Fronts currently have 800lb Hyperco 2.5" diameter springs on them. I had to hack up the front adjuster hats to get the coilover sleeves on but they don't affect function at all. I do have new adjuster hats as well as dust boots and stock style spring perches for the fronts as well if you want to go back to that. Already shook down my money tree for all it's worth so I'm hoping to save a few bucks on an used unit. Is there a reason FRRAX isn't accepting new members? Other users have left no comments for landstuhltaylor.